Over at the Silhouette Plus forum there is right now a design challenge going on. There is no prize but I thought I would dip my toes into the Design pool. I have not really done a lot of designing with either the free version of Studio or the Designer Edition so I thought this was a great way to get started. The challenge is to use a letter in a design by replicating,rotating,welding,etc. This is what I came up with using a lower case s. I love this frame. I did have to weld a small rectangle at both the top and the bottom where the two letters did not totally touch. Otherwise there would have been a partial slit. This was the frame cut out as it was designed with only that small modification I mentioned. The Victorian lady was more of a challenge as I had to take her into paint.net and modify the graphic so I could do a good trace on her.She is pop dotted on the card as is the panel that has the frame adhered to it. The hearts are left over foil confetti from last year. For this card I took the frame and because I could not get it to just cut out the outside edge even after I picked cut edge only I traced it and then clicked trace edge only. I took my Brillance red gold ink and used a sea sponge applying it on the frame in a pouncing motion. When cutting the panel I cut it too short so put it on the diagonal which made it necessary to cut the edges on the side. 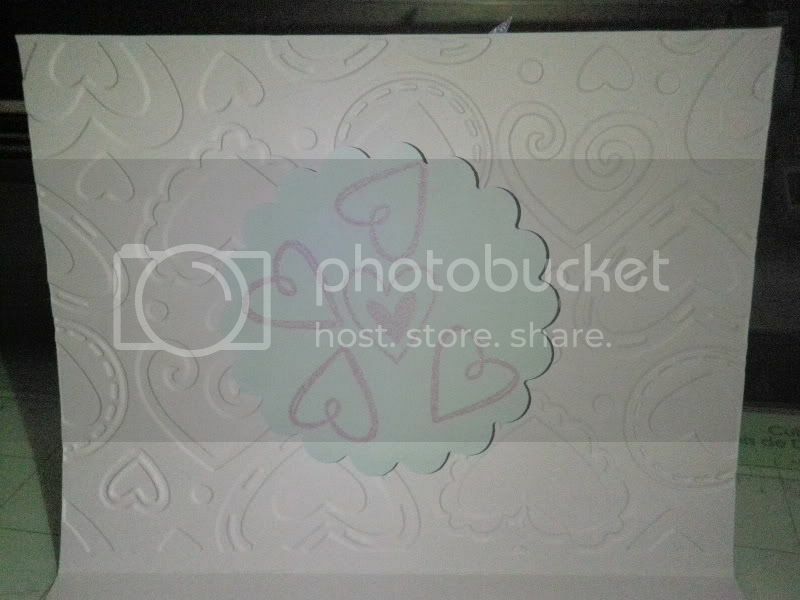 The heart which is a Silhouette file was cut out of a scrap of the background paper. I love how I can use tiny scraps with my cutting machine. The backing is a scrap of ribbon which I glued on and then after the glue was dry carefully trimmed it. Where the rhinestone is was a tiny hole in the pattern. When using small gems like this I place a dab of glue where I want it and then the gem. Since these are I rock gems I then use the hot tool to affix the gem. The glue just helps to keep it in place while I'm using the tool. The hearts in the corner are foam hearts which were left over from last year. If you have Studio or Designer Edition and haven't played with it for designing I challenge you to take a letter and play with it. It is a great way to learn the software. Do come back I will be sharing a flower shaped card I designed when I get it made. I also have several other projects in the works. Also thank you for stopping by. I don't know about you but I hate to throw things away. So what do you do when you are drowning in scrap ribbon and trim. How about using it in a card. A frame or window card to be precise. So here is the card I recently created using scraps of ribbon,lace and trim. The first thing I did was to go into studio and start a new file. I drew a rounded square. Then went to the library and opened the heart and resized it. Using the knife I cut off the curly q bottom of the heart. Then I placed the heart where I wanted it to be cut out. I then went and did an internal offset for the square shape. 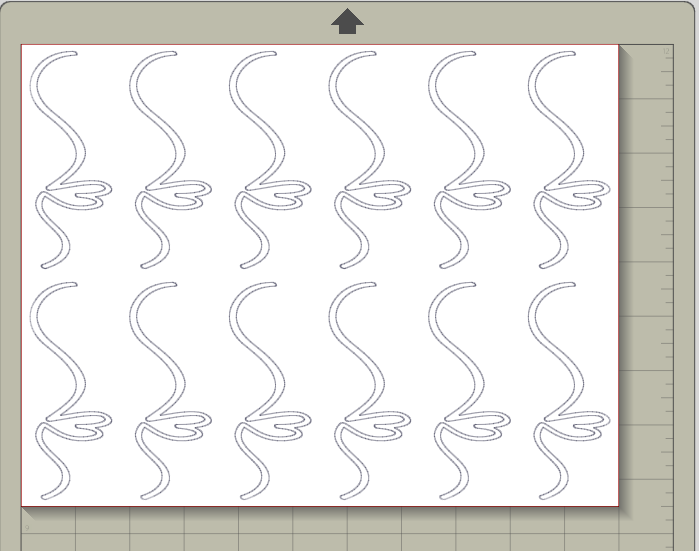 Changed the line to a dashed line and edited the corners so that it would look more like stitching. Then selected the heart and ungrouped it. Then I changed the outside solid line to a dashed line. Changed the color of the line and made sure that the box to print selected lines was checked. Oh since I was printing the lines I used the registration marks because I wanted to make sure it was going to cut right. After it was printed and cut out I went through my scraps trying to decide what I wanted to use. Then I traced the heart on the front of the card after I decided where I wanted it to be on the card. I decided to have the panel off to the side instead of centered. Then using a tape roller I adhered my pieces of ribbon and trim to the card base. This is what it looked like. You can see the pencil through the lace if you look carefully. I did have to trim the ribbon a little bit along the edges but since I used a repositional tape to adhere them with it was no problem. Next time I won't be so adhesive happy and will stop just past the line. I added buttons to the panel in the corner. I like to play with buttons and thought I would make an abstract heart with them. Then I pop dotted it onto the card base. Took a scrap piece of card stock and tore it to make the tag and heat embossed the Valentine sentiment. I was just going to stamp it but my white chalk ink did not show up as crisp as I wanted. I forgot that chalk inks are more transparent and softer. I found Wednesday at a store the Simplicity gems on a string which are self adhesive and since the gems were pink I had to buy them for making cards. Of course I had to use them. LOL! You could of course use any shape you wanted. I think this would be pretty done with the cut out of a flower or a butterfly. Thank you for stopping by and looking. Do come back as I will be posting next week how to make embellishments using scrap pieces of ribbon. I think you can never have too many bookmarks. Besides that if you do you could always use them in a collage or something I guess. Anyway I was going to make bookmarks for a book club I'm in for Christmas but never got around to it. Well this week I'm hosting the book club and since we will meet again after Valentine Day I thought I would make some Valentine theme bookmarks to give out. I was in luck as Florabella Collections had a free Valentine download and in with the freebies was two bookmarks. I used the back side bookmark file for the pink and the blue one as the front side one had the to and from on it. O.K. I was having a terrible time taking pictures. I finally got some really good pictures only to discover that they were taken on the internal storage of my camera which I have not figured out how to retrieve pictures from. The bookmarks kept falling off the book stand just as I snapped the picture after I got the card in the camera. So these are not as artistic pictures as I took them just lying flat on a book. I originally took one of the png files of the bookmarks into Studio and traced. That is when I discovered that the gingham edges were jagged. 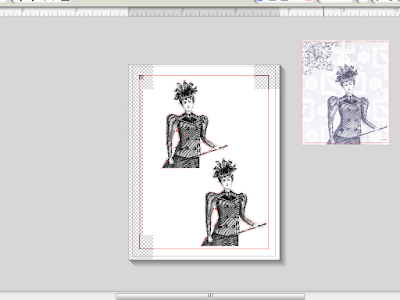 Not wanting to mess with the file in a graphic program I used the png files as a fill pattern. That way I also was able to get nice rounded corners which I find more pleasing. I decided to make these smaller than the original ones so I could get three to a page instead of two. They still are a nice size I think. I was going to buy mini rickrack to put over the rickrack that was printed. It is an off white color and to me just doesn't look right. Then decided instead to make tiny heart banners. After the heart banners were cut out I painted them with fingernail polish. I love the fingernail polish on the pink bookmark it is actually glittery. While the fingernail polish was drying I used my clear star dust roll on glitter pen to out line the heart and the x's and o's inside the heart. Originally I was also going to do the letters but I changed my mind. After the fingernail polish dried I glued the banners on. O.K you will notice one thing missing they have a hole in the top but no ribbon or cord. The reason being that out of all the ribbons and cords I have I don't have white or a color I like. Actually lol I just wanted an excuse to go craft shopping before the end of the week but we won't tell anyone. The original file didn't have a hole in the bookmark but I like to add beads on a cord or ribbon so the bookmark will hang out of the book without the actual bookmark getting bent. Also then if a person wants to hang up a bookmark they can. Thank you for stopping by. Have a Great crafting day and don't forget to pick up digital freebies when you find them. You never know when they might come in handy. On a blog I saw a scrapbook page which had a library pocket with strips of papers saying what was loved about the person on the scrapbook page. Originally I was going to make a card with a library pocket on the front. However, when looking through my graphics to fill the pocket I found one I liked but realized that the middle of the pocket would be the back so would not be seen on a card unless I cut a window out. So the pocket is the card itself. LOL! As far as I know there is no rule that says that cards must open to be cards. This was before it was glued together, I wasn't sure how I wanted to do the inside. I used a cotton ball and pink chalk ink to color the inside since this was printed on white card stock. If I can't find a large pink paper clip I'll change the color of this one with nail polish. This is the back of the pocket. I was going to ink the strips like I did with the inside but now I'm leaning towards leaving them white. When I was panning the image I wanted the front to match at the overlap and could not get this centered on the back. I don't think though that it looks too bad. This is how it looked on my work space in Studio. I took the library pocket file which was a free file and re-sized it to 4.50 x 8.00 inches. I wanted a size which would fit in an envelope without me having to pay extra postage. The card is approximately 4.50 by 4 inches. The font I used for the words and numbers on the strips is AmoreATT. I filled text and numbers with black and turned off the cutting. I have not decided yet whether I will hand print with a gel pen or print on velum paper the sentiments I want to use. I could have added my text right on the strips before cutting them. I decided to go ahead and fill the strips in with a gradient pattern after capturing this picture of my work space. Often my project evolves while I am working on it. If you are planning to use the library pocket file you will probably want to change the cut dashed lines to perforated lines like I did. Why they were not perforated lines I don't know but take it from me the dashed lines are "ugly" when the pocket is cut out. I had to go back and redo the placements of the fonts. I forgot to take into consideration the flaps overlapping. Then I printed and cut it out and still had one letter covered so it was back to redoing one side While at it I made the words more uniform in size. Although I made the word love just a bit longer. The hardest part was getting the words correct. LOL! And don't be surprised if you see the back side of the pocket where the letter got covered on the front on a different card. I try not to waste anything. I already have an idea for using it. A friend I showed it to wants me to make up a pocket for his Mom so he can put ten wallet size pictures in. You could put a list of ten things in the pocket instead of individual strips. Perhaps with a coupon or gift card for V day. How will you use a pocket card if you make one? I would love to hear your ideas. Thanks for taking the time to read my post and do come back. I think of all the ones I did today these two are my favorite the bottom one really sparkles. This is how the file looked before I cut it out. The directions below are how I modified the original file. 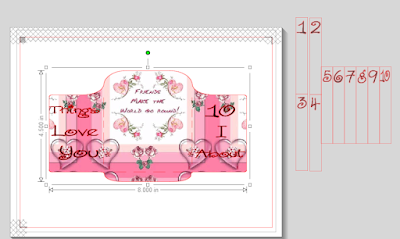 Because I will be using this heart border on cards I've resized it and replicated it on my mat. No sense in just cutting out one. I did change the height after resizing.as the first page I cut they tore easily taking them off the mat with my spatula. So the heart is more elongated than in the original file. You could have less on a page and make some of them a print and cut by filling in with a pattern if you wished if you have a die cutting machine like the Silhouette which will allow you to do that. However, I want to do some playing and experimenting. Of course after glittering one I decided that I will go to the Craft store for some fine glitter as well as some metal leafing. I want to play with it and see how it works for making my own embellishments. Oh and since we are being frugal here you can take the negative and use it as a stencil after you cut out your heart borders. You could put it over your card stock spray with adhesive and carefully remove the stencil and quickly sprinkle either flocking or glitter over the glued areas. If you don't want to mess with spray adhesive how about stamping your watermark pad over the stencil and then chalking,heat embossing,or using Perfect Pearls. O.K if you have not figured out from the first picture what I used to take my plain ivory colored card stock and change them this is what I used in my play. From top to bottom. Fingernail polish. Yes you read that right. It is so shiny. I'm going to be looking through closeout bins and going to the dollar store. I think some with sparkles in it would be nice. Heat embossing powder. Both a plain purple and a white I had mixed some glitter in during an earlier play session. Martha Stewart flocking with glitter. Glitter both a pink and a white crystal. Am going to invest in fine glitter though. 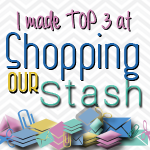 I would love to hear what you use to make your own embellishments. As well as what unusual things you use for your projects. Have you used eye shadow or other make up? Thank you for stopping by and do come back again. LOL! You never know what this crazy experimenter might have up her sleeves. I loved when I was in school making valentines. The paste,lace doilies and yes sappy verses. I still love making cards to give and have fun being creative. This is my first Valentine of the year. It changed from my original idea after I had embossed the card base and printed and cut out with my Silhouette the calendar page for February. I like it a lot better than my original idea. First I embossed my pre-scored card stock. I then chalked it and put it in the folder again moving it just slightly as the one edge was not embossed. I like how it turned out. I want to do some embossing and chalking and then run it through again without an embossing folder to flatten the embossing. It leaves the embossed area flat and colored more intensely. The calendar page is a PDF file from seaside creative com. I screen captured it and went into PaintNet where I cropped it and added the page curl. I just yesterday saw a card where the woman had used a scrap of paper that had holes punched in it so she tied hearts to dangle. That gave me an idea to use my border punch. LOL! I actually went in my garbage sack to take out the card stock I had printed and cut the calendar with. While looking for the foam hearts I bought last year I found gift ribbon and thought with the gray it was perfect. Originally I was going to stamp a heart on the 14th but the small foam heart was perfect. Because the foam hearts were adhesive back I sandwiched the craft floss in between them. So there you have my frugal card. Made with everything I had on hand. LOL! That is other than having to surf the web to find the calendar page. Thank you for stopping by. Do come back and I hope I have inspired you to make some hand made love. Where is your camera? Is it in a box somewhere? Do you even know where it is? I challenge you to dig out your camera and if you don't use it often to use it. See how creative you can get with it and challenge yourself. Taken while lying in bed. I tried different settings but could not get my camera to photograph the falling snow. Oh well perhaps some day I will figure it out. Thank you for stopping by and do come back. I will in the near future be doing some posts on using freeware Paint Net. If you can not afford Photo Shop and some of the other graphic programs out there this is a great alternative. Recently while collecting Dover samples I saw this fashionable lady and for some reason fell head over heel with her. (If you have not signed up with Dover Publications for their weekly samples hop on over and do so. They have some fantastic graphic art. )I first saw the image with her in the background, Then while I was going through the samples there she was without the background and in black and white. How lucky could I be as I was going to trace and cut her out of the background. I have traced and duplicated the lady by herself so I can use one copy as a mask. This is how it looks in Studio for cutting. I will have to do a little bit of cutting with my craft knife but figured it would be faster and less stressful than fighting with those pesky points to edit the lines. The red lines are the cutting lines. I did go back and resize as the image was bigger than I wanted so now all the pieces fit on one piece of card stock. Sometimes for me even though Studio tells me the size of something I have a difficult time visualizing it until I print or cut it out. All is not lost though as I can use the one that is the wrong size for playing with colors and techniques or in a different project. Here are my supplies and card stock I used for the background, For the background of the focal point and the lady I used the inks and chalks. I played around first with my chalk inks, distress inks, and chalks with the images that were too large to get an idea of what I wanted to do. Also spent time playing around with different pattern card stock before deciding on this one. I ended up not needing to use the pink chalk ink to edge the lady as my chalk did just fine. Although it might have been nice to have inked the edges of the focal background. For the background of the focal point I used a cotton ball with light pink chalk after adhering my mask.I sprayed the back of the mask with re-positional spray. It is sticky enough for your mask to stay down but not so sticky it will ruin your card stock when you take it up or leave a residue. Some people use post it notes to make masks. This is with the mask off. Masks are a great way when you want to color just certain areas with chalk or inks. Here the second lady is colored with antique linen distress ink for the face with a little bit of light pink chalk added. I used the tool that looks like a pen for adding the distress ink and chalk on the face as well as for coloring her gloves with chalk. I used a q tip for putting the darker pink chalk on the outfit. Took a piece of ribbon and tied for a scarf and added rhinestones where the buttons were. Now I'm just waiting for the hat pin to dry. Once that is added I'll pop dot this lady on the background. The hat pin is clay formed on a bead pin and then painted with white perfect pearl mixed in a little bit of water after the clay dried. I will cut the wire shorter before gluing it on. I would have loved to have added a tiny feather but didn't have any the right color. I love pattern card stock like this as there is so much you can do with the scraps. 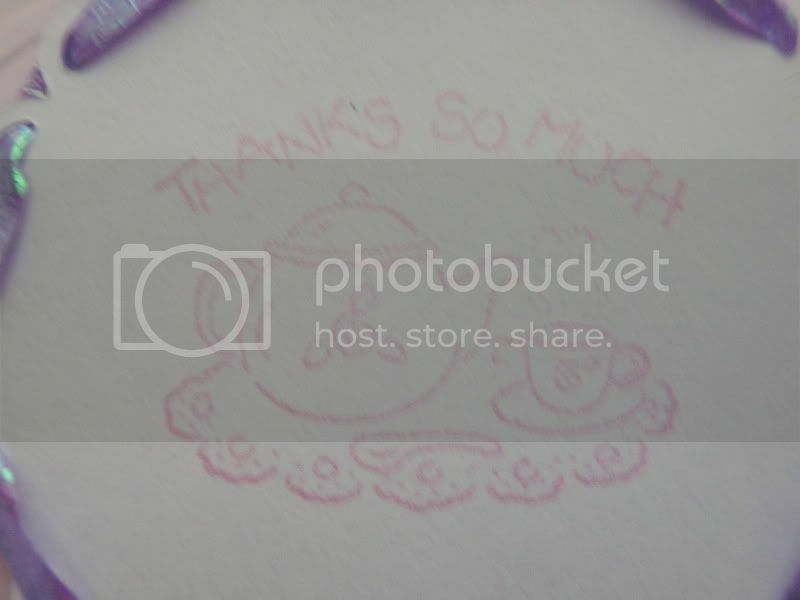 This card stock is from a stack pad named Black Currant by DCVW. There are beautiful foil card stocks in this collection. When I see card stock pads for half price I grab them even if I don't have an idea of what I will use the card stock for. I know in the future I'll find a use. It definitely is cheaper than buying 12x12 card stock at a dollar or more a piece. If you have stayed with me so far here is the finished card front. Ta Da! Opps! I forgot to chalk the one sleeve where I used a emery board to smooth it a little. Easily done with my q tip and chalk. Especially since she was pop dotted. I got the shadow that I wanted by making the cut out lady just a hair smaller and leaving her the blue gray on the background by masking. Notice that by cutting the background just a little shorter on the bottom that she extends beyond it. I think it gives her a little more dimension. Hey though I am just a woman who flunked art class. LOL! So what do I know. Thanks for stopping by. I hope that perhaps you learned a new technique or have been inspired to make your own creation. Please leave a comment telling me what you like,what you don't like or maybe even how you might have used this image. I was going through my stash of cards and realized that I did not have any sympathy cards. I could rush to the store and buy one but it is not the same as a handmade one. I was thinking today what kind of card I would like my family to get when I die and came up with this. I would want them to get something cheerful . As well as something symbolic with hope. The butterfly to me is that symbol. The butterfly was cut using a free Silhouette file I just ungrouped and used the solid butterfly to add text to. The text is sketched with a Silhouette sketch pen. I edged the butterfly with a gold paint pen and added a rhinestone.Then pop dotted it on the front after folding the wings slightly. The inside I used the free Silhouette frame file. Ungrouping and deleting one of the set of lines. Then entered a poem I wrote in Studio and sketched the words before cutting it out. There is a lot I could have done with this card but sometimes I think simple is better. 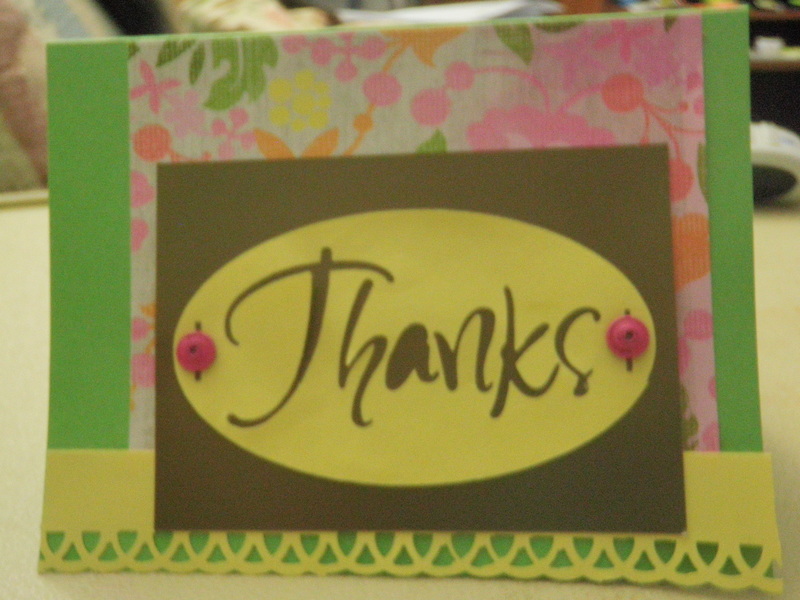 Do you make sympathy cards and do you like to make simple ones or more detailed ones? I really like how this card turned out. I wanted to use the border punch that I was given as well as some of the card stock from the pad that I bought with a gift card I was given. I used the free Silhouette thanks tag file to cut out the tag. The background card stock is from the Specialty Papers pad. The yellow tag is attached to a paint sample chip from Martha Stewart. The chips are the perfect size and have no visible printing on the front of them making them perfect for card making. In particular I like the metallic samples and the pottery ones. Although this looks brown in the picture it is actually a greenish color and has more of a metal look to it. The brads are from Karen Foster they were a gift from someone else but I thought they just added to the card. I wanted to add a touch of pink that was in the background in the card. When people give me craft supplies or I buy supplies with a gift card I like to use them in a thank you card for that person. My next thank you card is going to be a little more labor intensive and I'm still percolating ideas for it. In the meantime someone wants me to get their stencil made so I have that to do. Also I really need to start to carve out a crafting spot out of a spare "junk" room. Have you used paint samples in your crafting? What free things do you like to use in your crafting? I hope that everyone had a wonderful holiday. I had a crafting dream Christmas. My sister gave me a gift card for a craft store which was totally unexpected as we normally do not exchange gifts. Someone else gave me a border punch I had been eyeing along with a gift card for Michaels. I was given some construction paper and the Crayola Reversible construction paper cuts like a dream with a cutting machine. As if that was not enough I received a package from a craft blogger full of all kinds of craft goodies. She had asked for my address as she wanted to send me a set of stamps she had. I was so touched by her generosity. Now I am busy making thank you cards. I have not spent all the money on the gift card from my sister but wanted to send her a card using what I had bought. So here is the card I made for her. 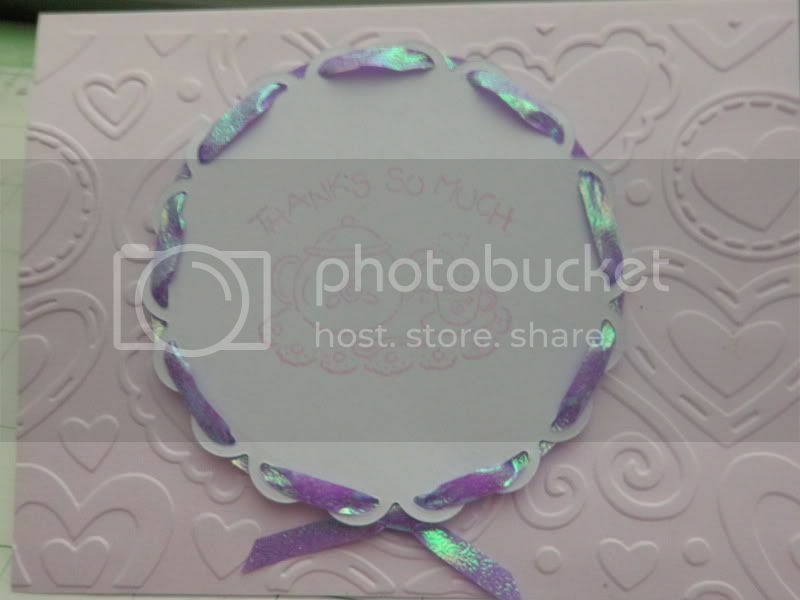 I cut a scalloped circle out of the card base using a spellbinder die and then cut a larger circle to put on the front.Ribbon is gift wrapping ribbon that was in a bag of ribbon and laces I bought at a thrift store. I felt like the circle looked too plain and the ribbon really makes it pop I think. The circle is pop dotted on the front. Stamp in a box of stamps at a yard sale for $3 for the box. Hearts stamped on other side of circle. They are actually peeking through the window. I hope you have been inspired by my card and the techniques I used. Do come back again because you never know what I may doing next. 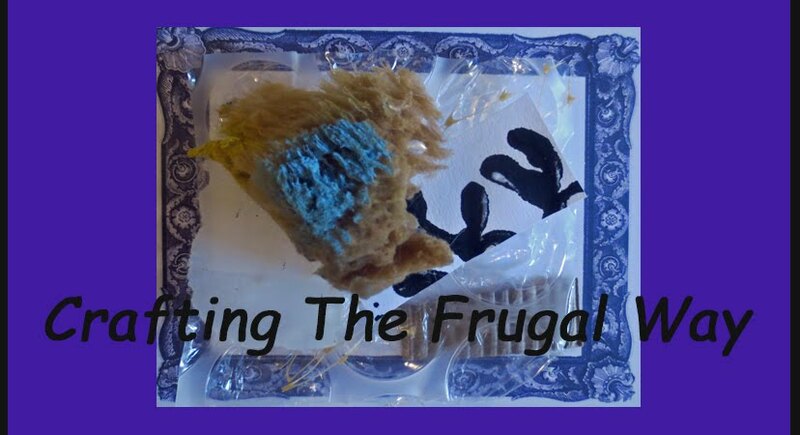 Wishing you a frugal crafting New Year!